A wine glass consists of three parts - the bowl, the stem and the foot. 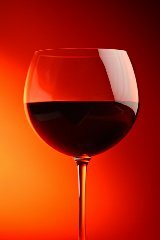 There are many different types of wine and the glass is usually designed to be used in conjunction with a specific wine. The glasses are often produced using blown glass which helps give the vessel a thin lip. Lead crystal is used for the highest quality wine glasses due to the refractive qualities of the glass. To enable white wine to remain cold it is best to hold the glass by its stem. For red wines this is not required and would be considered pretentious if done by the drinker. 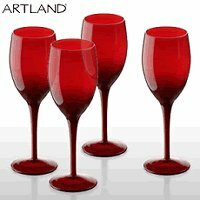 There are different shaped glasses for red wine, white wine and champagne. To allow red wine to breathe the glass's bowl is rounder and wider. The bowl shape also allows the wine to cool after being warmed by the drinkers hand touching the bowl and remain at room temperature. A white wine glass is designed to keep the wine chilled. This is done by reducing the surface area in contact with the atmosphere. White wine glasses are narrower and have straighter edges than red wine glasses. Chamgagne flutes are also designed to keep the drink sparkling and so enhance the flavour and drinking experience. Here is a range of stunning and stylish glasses guaranteed to add a touch of colour to any dinner party. Or why not make your Christmass dinner table even more festive.